i’ve only been to one cookie swap in my life. it was hosted by a high school friend’s mom, and i can’t remember anything besides the fact that my mom and i made chocolate crinkle cookies (thing 1001 that my mom always asks me to make again). this past year i’ve really been wanting to go to another, but no one i know hosts any. nor would the majority of my friends participate if i had one (it was/is finals season, some snub baking cookies in favor of “cooler items,” others are vacationing, still more are strictly “no baking, eating only”). so instead, i signed up for the great food blogger cookie swap. these coffee almond shortbread cookies don’t scream christmas like peppermint or gingerbread flavored goodies do. however, coffee and almond work allll the time, and there’s plenty of christmas-y options out there if you want. and they’re perfect for a little dessert. for my family, that means grabbing one out of the container before retreating to the couch. but if you want to make it more of a dessert course, say for a party or get together, they’re great with some coffee or tea or hot water (in case you’re an old chinese woman. which includes me. some of my friends refer to me as grandma in their chats, and i have to say that it’s more accurate than not). i made my logs too short and wide instead of longer, thinner logs, so i ended up cutting all the slices in half and calling it a day. a whole coffee bean seemed like a lot based on the size of these shortbread cookies, so i broke each bean in half lengthwise along the seam. of course, you don’t have to. make sure that you like how the cookie looks at this point; the cookies don’t spread much during baking, and what you see now is what you get later. they’re extremely fragile and crumbly right out of the oven (they are shortbread cookies after all), but they do firm up once they cool (so it’s not as stupid as you might originally think to try to send these cross-country). and say they do crumble- you can still scoop the crumbs into your mouth (may or may not be guilty of this one), or spoon some over ice cream (vanilla, coffee, hazelnut, chocolate, mocha almond fudge, etc). 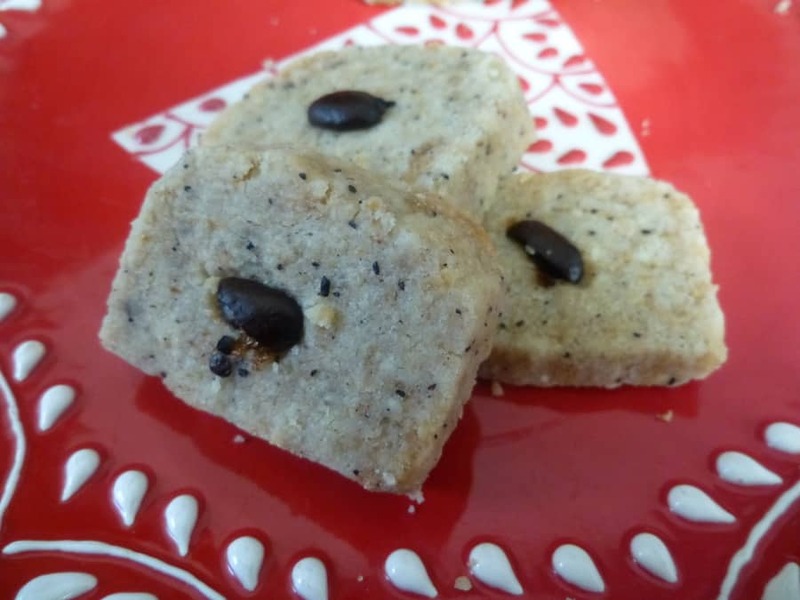 these coffee almond shortbread cookies are lightly sweet and buttery, crumbly and tender with a hint of coffee. the almond doesn’t come through much, so if you want a stronger flavor i’d recommend adding a dash of almond extract. otherwise, it’s a mellow background flavor behind the coffee and butter. 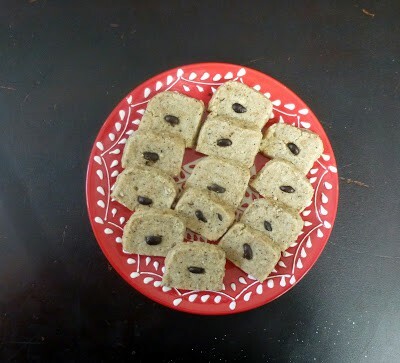 you might be tempted to skip the coffee bean on top (i was; it sounded a little out there), but don’t do it; it’s crunchy and adds so much flavor and that little nibble with the coffee bean was the best part. Combine the flour, walnuts, sugar and salt in a food processor and pulse until the nuts are finely ground. Add the coffee and pulse to mix. Add the butter and pulse until the mixture looks damp and crumbly. Drizzle in the brandy and vanilla; pulse until the dough begins to clump up around the blade. Alternatively, you can mix the dough by hand: combine the flour, nuts, sugar and salt (you need to grind the nuts before, or use nut meal). Add the coffee and mix well. Cut in the butter (a fork could work, though I prefer a pastry cutter) until the butter is almost completely broken down and the dough is crumbly. Drizzle in the brandy and vanilla, and mix just until the dough comes together. Knead the dough a few times by hand to make sure it’s cohesive. Divide in half, and form each into a 12” long, 2” thick log. Wrap in plastic wrap and refrigerate for at least 2 hours (preferably overnight), or up to 3 days. It can also be frozen for up to 3 months. Use a sharp knife to cut 1/4” thick slices. (If the dough crumbles when you cut into it, let it soften for several minutes.) Place 1” apart on silicone-lined baking sheets. Press a coffee bean (or half if you don’t want as much coffee flavor) into the center of each cookie. Bake the shortbread cookies at 350F until light golden brown at the edges, 12 to 15 minutes, rotating the sheets halfway through baking. Let the cookies firm up on the pans for 1 minute, then transfer to a rack. Cool completely. This looks delicious Heather! I LOVE shortbread and with coffee? uh, genius! !